Life Balance, Harmony, Beauty, Vitality, Aqua, Nature, Nutrition. These Seven Pillars of well-being come to mind as you take the spiral staircase down to The Lagoon Spa and enter an environment of balance between the four basic elements governing human life. Your experience will ensure a truly 5 Star spa journey, bringing revitalizing days and blissful nights as you experience holistic treatments that soothe your soul and energize your spirit. A minimum of twelve 12 hours' notice is requested for all bookings. For cancellations less than 6 hours prior to your scheduled appointment, a 50% cancellation charge will apply. Guests who do not turn up for their booking will be charged at full rate. 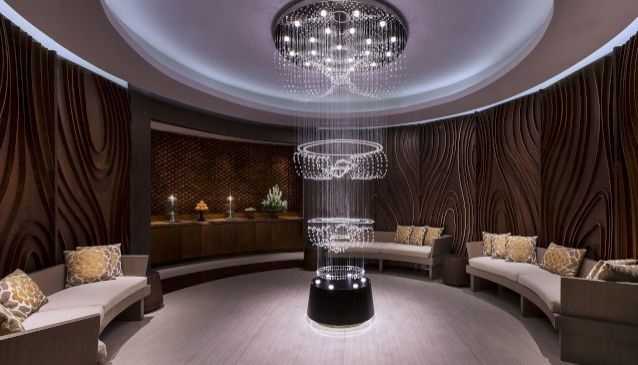 Guests are expected to arrive at the Spa reception at least 10 minutes prior to a scheduled appointment. Late arrivals will be subject to reduced treatment time. So that guests can receive the full benefit of relaxing treatments it is requested that all mobile phones are set to 'silent' mode. The Fitness Centre is open 24 hours. Fitness classes are at set times and a personal trainer is available upon request. Please enquire at the Spa reception for the schedule and outdoor locations. Children under the age of 16 are restricted from using the Fitness Centre and Sauna. Beauty is an on-going quest for increased health, skin radiance, inner balance, complemented by an overall feeling of well-being. Each person represents beauty in a unique and wonderful way. You are a unique individual with specific skin care concerns and only a qualified face, body and spa care professional can assist you in your quest for personal well-being. All spa products used in Lagoon Spa are available for purchase, including branded products, as well as authentic traditional Indonesian natural spa products, carefully packaged to suit your needs. Gift certificates are available for all spa treatments and packages. The Lagoon Spa is open from 08.00am to 12.00am daily. The Fitness Centre is open 24 hours. Fitness classes are available and a personal trainer is available upon request. Please enquire at the Spa reception for the schedule and outdoor locations. Reservations are recommended as spa treatments and facilities are subject to availability. Please dial extension 5587 to make your appointment. Situated in the middle of the resort, Lagoon Spa is surrounded by the crystal waters of the swimmable lagoon. The Spa is accessed from the Lobby level across from Cornerstone Vinothek, and on the ground level, underneath the waterfall.